After careful consideration, the Captain and I are officially removing ourselves from Running Teapot Racing at the Oamaru Steampunk Festival. We will look to running Splendid Teapot Racing (trademark pending) at another event. We have had a lot of fun running the event at the Oamaru Steampunk Festival and hope you have had fun with us. Watch this space as we will let our fans know when we run out next event complete with TLeaf sponsorship. What a fantastic day, thank you to all, especially our sponsors. there are more photos on the Splendid Teapot Racing Facebook page. With all the last minute preparations just about completed, the Captian assembled The TleafT Expeditious Distillation Trophy. This trophy was named via a customer competition at TleafT. How cool is that! The TleafT people are seriously cool. Saturday 3rd June, you can come along on Saturday, Oamaru Workings Men’s Club, 2 pm there will be door sales on the day. Online registrations will close – Thursday, June 1st at 5pm. You can still enter and register your teapot racer but you will have to be at the Hall at 1 pm on Saturday to do so. Registrations on the day will close at 1.45pm. Thank you – see you all there. It was all over the headlines when Alice was arrested and jailed briefly for public intoxication while her boyfriend, the Mad Hatter, was charged with a DIC for driving the car under the influence of alcohol. Though she had to address the issue of the recent media attention for her drunken night out, her focus remains on her sobriety and new hobby, Splendid Tea Pot Racing, where this year at Oamaru she will be a first-time contestant. Splendid Teapot Racing will be held this weekend in Oamaru, 2 pm at the Working Men’s Club. The author can not confirm or deny the accuracy of this story, no animals were hurt in the making of this story, a story is a story and it possibly can be alleged that the author may have consumed vast quantities of coffee and chocolate at the time. Carry on…..
Eleven Days to go, are we excited? 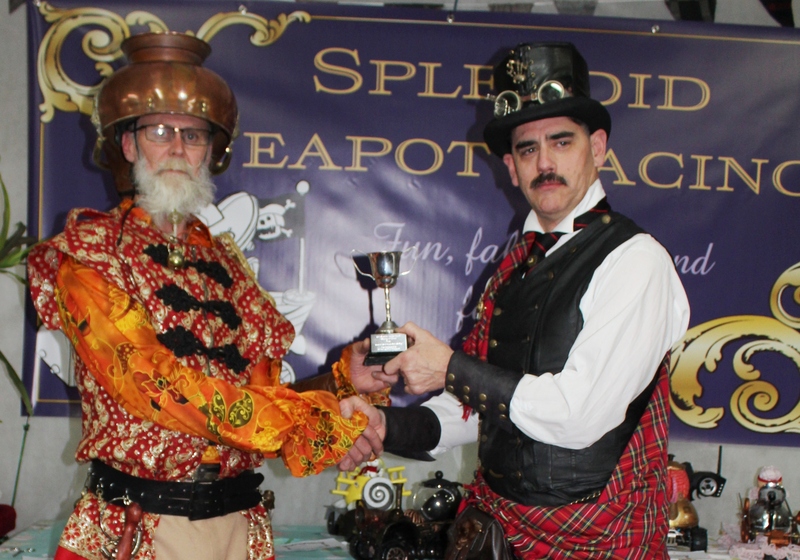 It’s the final countdown for the NZ Steampunk Festival’s Splendid Teapot Racing. It’s going to be great! Splendid prizes and splendid people. Huzzah! It gives the Captain and I great pleasure to reveal to you the new 2017 Splendid Teapot Racing badges. The winners will receive one with a “winners” bar. You can purchase yours on the day or from me at any time for $25.00 (+p&p if I need to send it to you). Each year there will be new date bars and I will do a back order of previous date bars if people let me know what they would like, they will be $5.00 each. Please share your love and support for these businesses who have sponsored prizes for Splendid Teapot Racing at the Oamaru Steampunk Festival 2017. Without these people live would be a bit more boring! I hope your teapot building is going well – we have a splendid line up – 24 entries so far, Brilliant prizes and fun fun fun. The cushions will be out for those brave enough to get up close to the action, the new wibbly wobbly bridge is under construction – it’s going to be a great afternoon!